Two pounds of strawberries, 11 eggs, 14 ounces of whipping cream, a lot of sugar, and a little bit of gelatin make one delicious and pretty cake! My first challenge with The Daring Bakers was fun and a true experiment for me. I’ve never made a mirror cake before, so I have to send a big thanks to Peabody of Culinary Concoctions for choosing this one for the group. When I saw the photo that she posted, I had a feeling that this would be one of those beautiful cakes that you make for special occasions. How right I was, and oh how I wish mine had turned out as lovely as it did in my vision! In spite of some missteps along the way and an imperfect finished product, all of us who tasted it agreed that it was delicious and well worth the effort. I’ve shared my Top Ten Culinary Flops (So Far), and now it’s time for you to hear the whole story about making this cake…the good, the bad, and the ugly! I decided to make the cake on a weekend so that Michael would be around to play with the kids, freeing me to work with fewer interruptions. I had printed the recipe earlier in the week and read over it, making notes in red ink and planning my strategy. On Day 1, I would bake the cake and if time allowed I would make the strawberry puree, the strawberry juice, and the soaking syrup. 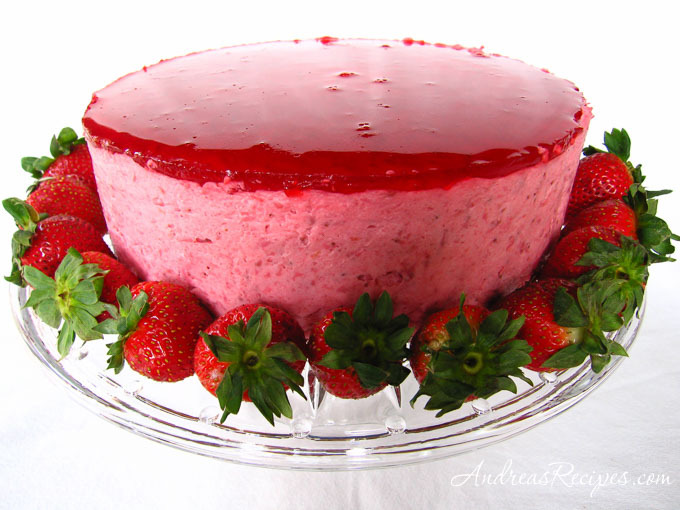 On Day 2, I would make the Bavarian Cream and the Strawberry Mirror, and then assemble the cake. Then I would serve the cake the next day for a play date dessert. The Little Man decided to mess with the nap schedule, and that had a domino effect on the entire rest of the day. It was almost 8 pm before I finally got to start making the cake. Right off the bat I found out that my jellyroll pan was too small, a mere 9×15, and would not hold all the batter. I was a bit annoyed with myself for not measuring the pan earlier in the week and dealing with the issue before I was ready to bake. The recipe calls for an 11×17 pan, which I did not have, so my first compromise was to use one of my half-sheet pans, which measure slightly larger. Making the egg yolk mixture and whipping the egg whites was pretty straight-forward and everything seemed to be moving along famously, that is until I tried to pour the mixture into the prepared baking pan. Large streaks of yellow appeared throughout the mixture, and I realized with horror that the egg yolks hadn’t thoroughly mixed with the egg whites. The batter at one end of the pan looked very yellow and the rest of it looked white. I couldn’t pour it back into the bowl, so I tried swirling it together in the sheet pan using a spatula but nothing seemed to work. So I spread it out as best I could and put it into the oven. I thought that I would have to compensate for the slightly larger pan with a much shorter baking time, but it finished in 6 minutes. With my three adorable little distractions running around underfoot, I have an unfortunate habit of overcooking things, and I did not want that to happen this time around, so I parked myself next to the oven on a little stool and watched through the glass intently. I was concerned that the cake didn’t seem to rise as much as I had hoped, but I still had the image of the streaked mixture on my mind and I wondered how bad this first attempt would turn out. When the top seemed to turn a perfect light brown, I quickly removed the pan and set it to cool for 5 minutes, then I began the painstaking process of cutting the cake and removing it. This is where I ran into another equipment dilemma. 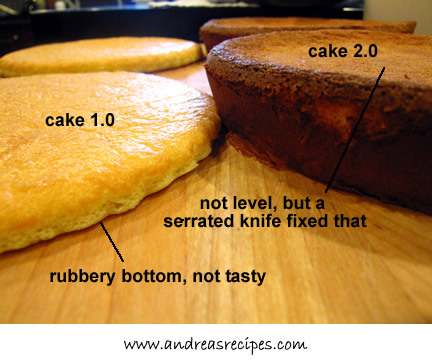 The recipe calls for using an inverted 8-1/4-inch cake pan to cut the two circles. I have 8-inch cake pans (old, ugly, rusted pans), but they have handles that stick out on each side. Obviously that wouldn’t do for cutting circles, so I spent a fair amount of time measuring all of my round baking pans to see which one would suffice. I ended up using a round 8-inch tart pan which scalloped the edges of the cakes, but I decided not to worry about that. When I started to gently peel the parchment off the cake layers, I noticed that the bottom of the cake seemed a bit…rubbery. And yellow. I took the two circles off and set them on sheets of waxed paper, then Michael and I began to peel back the remaining cake to see what was going on. My best guess was that the yolk mixture had settled to the bottom of the pan and solidified during the baking process. Annoying, at best. It made the bottom a tad bit chewy…rubbery. It was late and I did not want to restart the cakes, so I just finished the other things I needed to do (make the strawberry juice, the puree, and the soaking syrup, as well as getting the tequila lime chicken marinading for dinner the next day). I decided to sleep on it then look at the cakes again in the morning. This time I just poured the batter into two prepared 8-inch cake pans (my old, ugly, rusted pans) since my tart pan would not be able to cut through a cake as high as this promised to be. That part at least turned out correct. The cake rose higher than the edges of the pan and looked lovely, but it took longer for the middle to finish cooking and the outside of the cake was browner than the sheet pan version. Then when I pulled it from the oven and allowed it to cool, the middle sunk lower than the edges. I just pulled out a serrated knife and leveled the cakes. I was not starting over at this point! So that evening after getting the boys to bed, I prepared to tackle the Bavarian Cream, which was the part I dreaded. I never seem to achieve consistent results when it comes to whipped creams, and I did not want to start over with buying more strawberries! Michael quickly excused himself to go watch TV at the other end of the house, as far away from the kitchen as possible, and I let him know to just ignore me if he heard any colorful language. You can imagine how relieved I was when the Bavarian Cream process went smoothly, although it took quite a while for the puree to gel properly. My puree seemed a bit chunky, like I hadn’t strained it enough, and while that isn’t exactly traditional, we liked how the cream turned out with tiny chunks of strawberry in it. I assembled the cake, putting the bottom layer in first and brushing on the soaking syrup, then adding a layer of Bavarian Cream and finally the top layer of cake and finishing the spreading of the cream. It looked very nice in the pan, except for one little problem. There was no room left on top for the mirror. And I still had a lot of Bavarian Cream left in the bowl. Now what to do? First I tried to remove some of the cream from the top, but there wasn’t much there to begin with and removing any would leave just a paper-thin layer, and that just wouldn’t do. What I needed was a taller springform pan, but of course did not have one, so Michael suggested that I create a collar out of aluminum foil to add height. So I took the cake out of the pan, and when I did I found out that the Bavarian cream had not gone all the way to the bottom of the pan. Definitely ugly. So I disassembled the cake. It was quite a mess. I cleaned the pan, and then lined it with heavy duty aluminum foil that I had folded over a couple times to make it sturdy. The foil rose about 3 inches above the rim, leaving me plenty of room to add all the cream we wanted and still have room for the mirror. This time I put the Bavarian cream into a plastic bag and piped it into the pan around the edges to make sure the cream went all the way down the sides. I was determined to not have an ugly cake! By now it was 11 pm and I still had a mess to clean up in the kitchen, so I left the mirror for the next morning. I was expecting some of my neighbors and their kids over for a dessert play date this afternoon, and I wanted to serve the mirror cake. I planned to make the mirror right after breakfast so it would set-up and leave me time to get some photos before everyone arrived. I fixed breakfast for the boys and called them to the table. My oldest came right in, but my three-year-old didn’t, rather strange for him since he’s my kid who eats almost anything. I went looking and found him laying in the family room floor staring up at the ceiling with a glazed-over, feverish look in his eyes. He was burning up. Scratch the play date. I still wanted to share the cake, so I planned to take some over to each family later in the day after I had made the mirror and photographed the finished product. Making the mirror was pretty straight-forward. The liquid took a while to thicken, about 25 minutes, but once it did I just poured it on top of the cake. This is one point in which I disagree with the recipe, which calls for a 1/16-inch thick mirror layer. To me that seems insanely thin, especially given the amount of ingredients for the mirror, so I poured until I had about a 1/4-inch thick mirror, but I still had some leftover. I poured that into a small bowl and the kids and I enjoyed it for a little snack later. Best gelatin I’ve ever tasted! The mirror set up pretty quickly after refrigerating the cake, and I pulled the cake out with a sense of excitement, hoping that it would look as beautiful as I had envisioned but worried that it would look dreadful. It had some bubbles on top, but nothing that I was going to get excited over. To keep the mirror from tearing, I ran a thin, sharp knife around the edge of the foil collar, separating the mirror from the foil. Then I released the lock on the springform and began to slowly remove the aluminum foil. Finally, something worked in my favor! The foil released beautifully with only a few tiny spots of Bavarian cream sticking, but I was able to smooth those out. I turned the cake around, studying it carefully to see how it had turned out. The mirror seemed a bit uneven. Actually, as I looked closely into the mirror, the Bavarian cream underneath looked like the lunar surface. My neighbors got their samples later that day, and in spite of the lunar surface under the mirror, the cake was a hit! Rave reviews for how pretty it was and how wonderful it tasted. And now, the recipe (with a few adaptations for clarity). 1. Preheat oven to 450º F. Butter and flour the sides of an 11-by-17 inch jelly roll pan (rimmed baking sheet). Line bottom of pan with a sheet of parchment paper cut to fit bottom pan exactly. 2. Beat eggs, egg yolks and ¾ cup sugar together in a medium bowl until thick and light. (This is where you want to beat for a very long time, until the mixture triples in volume.) Beat in the vanilla. 4. Sift flour over the egg yolk mixture and fold in. Stir in one fourth of the whites. Then carefully fold in the remaining whites. 5. Spread batter evenly in pan. Bake until light brown and springy to touch (7 to 10 minutes). Cool in pan 5 minutes. Run a knife along edge to loosen. Invert cake tin to cut out 8-1/4 inch circles of cake. Wrap the cake layers, separated with waxed paper, and set aside. Cake may be frozen at this point. 6. SOAKING SYRUP: Combine water and the 1/3 cup sugar in saucepan; bring to a boil to dissolve sugar. Cool to room temperature; flavor with liqueur. Set aside or refrigerate in glass jar until ready to use. 7. ASSEMBLE CAKE: Brush sides of 10-inch springform pan lightly with flavorless salad oil or almond oil. 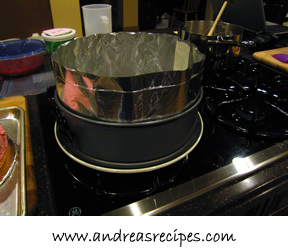 Cut out a cardboard circle that is exactly the same size as the bottom inside of the pan; cover cardboard with aluminum foil and fit into bottom of pan. Center one layer of the cake bottom of pan. 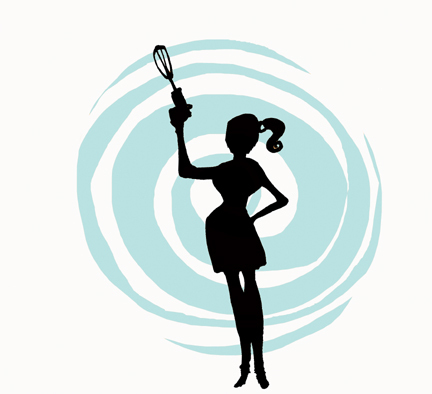 Brush the cake with some of the soaking syrup to just moisten (not drench) the cake; set aside. 8. 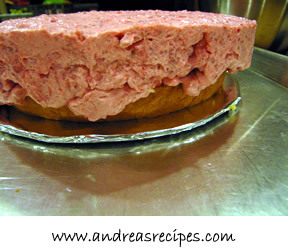 Prepare Strawberry Bavarian Cream. Immediately pour about half of the Bavarian Cream over the first layer of cake in the pan. Set the next layer of cake on top of the cream. Pour remaining Bavarian Cream over cake and smooth top of the cream with spatula. Refrigerate until the cream sets (1 to 2 hours). 9. Prepare the Strawberry Mirror. 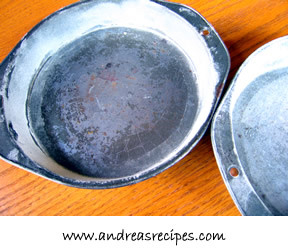 10 .To serve: Wrap a hot towel around the outside of springform pan for a few minutes. Run a small sharp knife tip around the edge of the Strawberry Mirror to separate it form the sides of pan. Mirror will tear when sides are unlatched if it is stuck at ANY point. Slowly unlatch the pan and slide it off the cake. 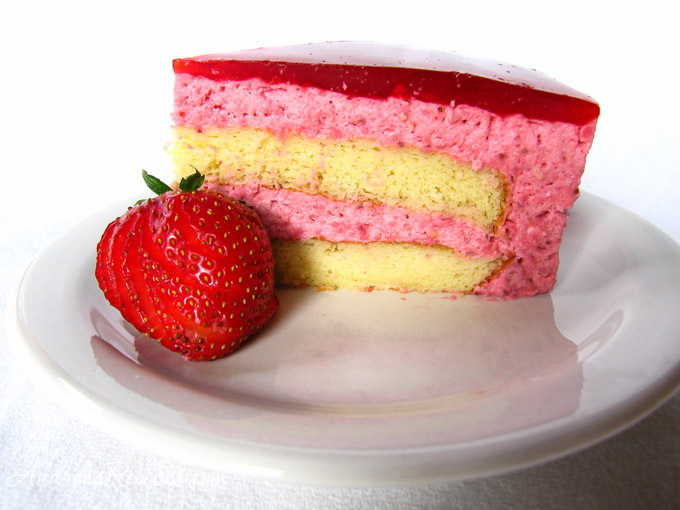 Slice cake in wedges and serve in upright slices. 1. 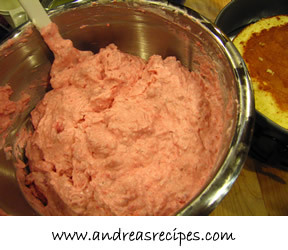 Sprinkle the gelatin over the strawberry puree in a small bowl and set aside until spongy. 2. Combine egg yolks and sugar in a bowl and beat until light. Bring milk to a boil in sauce pan. Pour hot milk into yolk mixture and stir with a wooden spoon. (It doesn’t say so but I would temper the egg mixture first to be safe.) Return this mixture to the saucepan and cook over medium heat, stirring constantly, until your finger leaves a clear trail in sauce when drawn across the back of the spoon. (Do not boil or mixture will curdle.) 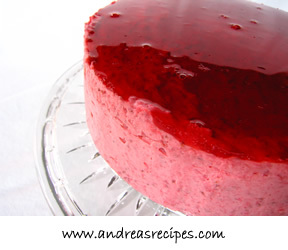 Immediately remove from heat and stir in softened gelatin mixture. Pour into a stainless steel bowl places over a bowl of ice water. Stir in lemon juice and a few drops of red food coloring. Cool over ice water, stirring occasionally, until mixture thickens to the consistency of softly whipped cream. 3. White gelatin mixture is cooling, whip the whipping cream until it holds soft peaks. 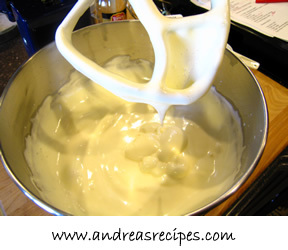 When the gelatin mixture resembles softly whipped cream, fold the whipped cream into the gelatin mixture. 2. Place lemon juice, kirsch, and water in a small bowl. 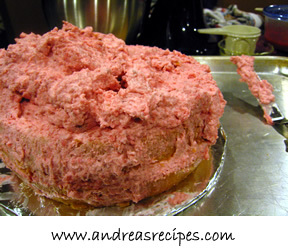 Sprinkle gelatin over this mixture; set aside until spongy and soft. 3. Measure 1-1/2 cups strawberry juice into a small saucepan and bring to a simmer; pour over gelatin mixture and stir to dissolve gelatin. Tint to desired color with red food coloring. Place bowl over bowl of ice water and stir occasionally until the mixture is syrupy and just beings to thicken (do not let jell); remove from ice water. 4. 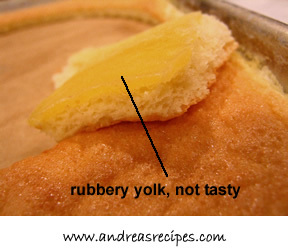 When mixture is syrupy, pour a 1/16-inch layer (I recommend 1/4-inch or more) over the top of cake. Refrigerate until set. Wash and hull strawberries; coarsely chop. Place strawberries in saucepan; crush to start juices flowing. Place over low heat; add sugar and water; simmer slowly 10 minutes. Pour juice and pulp through damp jelly bag or cheesecloth-lined colander and drain into a bowl for 15 minutes. (Do not press down on fruit). Well Done! Your persistence really paid off… I’m not sure if I’d have kept on trying like you did! Well done and Congrats!! Great job. You had me laughing at your cake 1.0 and 2.o…my computer nerd of a husband would certianly appreciate that. andrea, you haave the real spirit of a daring bakers! I made my in 3 days, too. it was such a nervous process, but I really enoyed it! What an adventure you had!! I’m glad that your perserverance paid off. Your cake looks lovely. I love how your mousse shows off the seeds in the berries! Very very nice!! Even though I did not strain my puree, I didn’t end up with chunky puree. HMMM. I suspect my strawberries had a high water content. Or maybe it was because they were organic!!! Hope to see your entry for next month’s challenge soon! The cake looks gorgeous…well done! Well done and Welcome to being a Daring Baker! Those little ones seem to triple your challenge. I really love the strawberry that came through in this cake. Visually stunning. Great idea to show the 1.0 and 2.0 cakes side by side! Excellent. Great job and first challenge! You’re “Think-I -Can ” attitude prevailed. Well done! What perseverance, specially with all your little distractions:). I had a slight problem in beating my whites, which was why my cake did not rise much. You are a daring baker and with a great result to show for it! Congrats on your first challenge! I looks like you worked hard and produced a wonderful cake. Trust me we all have our distractions when it comes to baking. Mine is always eating before. It’s such a vibrant red and I’d love to dive in to that bowl of cream, well done! Hi Andrea, I just loved your post and your perserverence! It looks like it all paid off, congrats on conquering this challenge! What a wonderful post. I was laughing so hard all the way through it, especially with the pictorial comments! Great job on your first DB Challenge. What a journey, and those are some great pictorial comments like breadchick said. But you got through it (and so did I) and we’re now both Daring Bakers yeay! Congratulations! Wow, what a story. Way to go for sticking with it. You’ve solved my mystery of why my cake didn’t rise, I didn’t beat the eggs nearly enough. I’m glad things worked out – and I think your finished product looks wonderful! I really loved reading your write-up! I love that you made multiple cakes too; I only gave myself time enough to do it once! Beautiful job! Yours looks so lucious! Oh my heavens! What a journey. I love the “diary” style of your post. But you know what … you made it through beautifully and I love the way you presented the end result. Well done! Your final cake looks absolutely perfect. It was well worth all your hard work and effort! Andrea, your perseverence and inventiveness paid off. Your photo looks fantastic with all the strawberries around the cake and that glass plate…very summery. You are truly daring to deconstruct and reconstruct the cake and it paid off. Pretty in pink! Great job Andrea! What a journey…but worth it in the end looks like! I appreciated the step by step write up! I loved your story Andrea… we could all learn from your perseverance in pursuing this challenge. Thanks for not giving up or giving in — and for sharing both what worked and what didn’t. And I agree with you about the amount of mirror the recipe calls for not being enough… It was the best part, there was no way I was only going to put a thin layer on there! Your persistence is very admired, Andrea – the cake looks beautiful! Oh, how I wish I was a Daring (and not easliy discouraged!) Baker! Every one of the cakes I’ve been reading about, challenges and all, has turned out picture perfect. You are all super talented baking gals! Thank you all so much for the kudos and support for my first Daring Bakers challenge! Just like I mentioned in my post, the DBs were there for me when I was stuck, and I’m so glad to be a part of the group! You are a great bunch! such vibrant color! great job on your 1st entry! I’m so impressed you didn’t give up Andrea! And even had the courage to dis- and re-assemble the cake. Can’t be easy with 3 little ones around. Beautiful job! Good for you for overcoming Mommy-hood to make such a lovely cake! Hope your little guy was feeling better quickly! Wow, it looks too pretty to eat it ! I think it is a challenge to bake such a cake. You must be great at baking. Like your recipe but not sure whether I could make it or not. Thanks for sharing all the details of the cake making process. I had the same experience making a mango mousse cake for a friend – i.e., I had to bake the sponge cake thrice because of the rubbery bottom!! Thanks for sharing your experience! It helped a lot!